In a city divided by extremes, the festival brings together all kinds of people to cook up something marvelous. It’s tough to generalize about New Orleans, particularly after the twin scourges of Katrina and the Bush administration’s catastrophic response. It’s a city divided by extremes. In one respect, it boasts the most open and welcoming culture anywhere in America; in another, well… remember David Duke. Since the flood, parts of the city remain in ruins, with entire neighborhoods falling into a pre-industrial state (flora, fauna, abandoned pets, even the occasional alligator). Meanwhile, other parts have been reborn better than ever. New Orleans has 200 more restaurants than before Katrina, but far fewer people, especially people of color. Solid numbers are impossible to come by, but according to the 2010 census, the city has roughly 24,000 fewer white residents than it did ten years before, and 118,000 fewer black residents. And if you think that was an accident, there’s an oyster bed beneath a BP oil rig I’d like to sell you. The tickets to Houston and elsewhere given to the city’s poorest residents made homeless by the flood were one-way. Outside Jazz Fest, one sees newly painted houses with manicured lawns next to collapsed properties that might be housing Bigfoot. You can walk down the street in New Orleans and happen upon terrific musicians, delicious food, indigenous art and people mingling to cook up something new from all of the above. But the festival brings it all together in one marvelously steamy (and impossibly crowded) place. 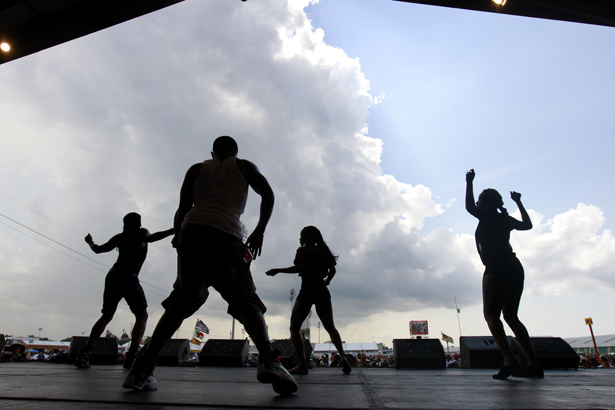 Founded in 1970 with an audience of a few hundred in Louis Armstrong Park’s Congo Square, Jazz Fest now draws some 400,000 people over two weekends, with twelve music stages and hundreds of staging areas for exhibitions by local artists, Native American ceremonies, cooking demonstrations and oceans of alcohol. While the biggest draws are often the touring bands (Springsteen, Eagles and Foo Fighters this year), many of the rest are local musicians doing what they do every night, but this time before an audience that is multiples larger. It’s an amazing feat of coordination—one that again debunks the cliché of a lazy, laissez les bons temps roulez attitude toward hard work—but pretty much everyone remains in a good mood, with lots of stranger-to-stranger conversations and the sharing of extra suntan lotion and spare beers. It’s a big business as well, since the festival’s foundation does well enough after everyone gets paid to provide $500,000 in grants each year to other nonprofit arts organizations, local writers, artists, photographers, filmmakers and education programs.